Unalloyed titanium (ASTM grade 1, 2, 3, 4) has been extensively used for handling and producing nitric acid in applications in which stainless steels have experienced significant uniform or intergranular attack. Titanium offers excellent resistance to HNO3 solutions over the full concentration range at subboiling temperatures. As the temperatures exceed 80°C [175°F], however, the corrosion resistance becomes highly dependent on nitric acid purity. 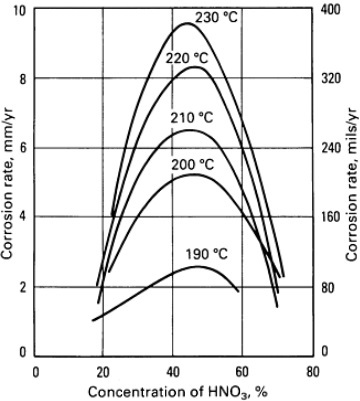 Fig-1: illustration of corrosion rates of unalloyed titanium in various nitric acid concentrations at different temperatures, refreshed solution. In hot, very pure solutions or vapor condensates of nitric acid, significant uniform corrosion rates may occur, particularly as temperatures increase. Since in these situations, full inhibition is not achieved in pure refreshed nitric acid solutions, semi-protective oxide surface films form that do not fully retard continued oxidation of the titanium surface. As illustrated in Fig-1 and Fig-2, mid-range nitric acid concentrations (20~70 wt%) are most aggressive in pure refreshed solutions. 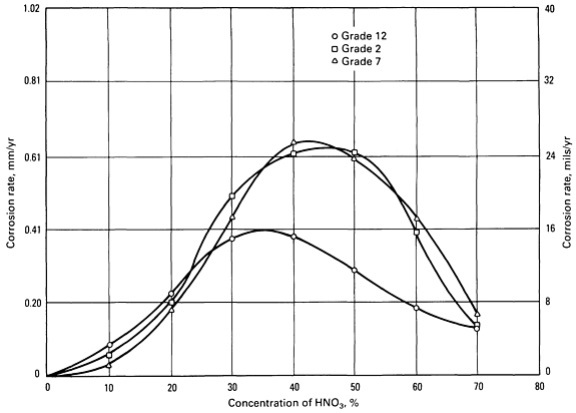 Fig-2: corrosion rates of grade 2, grade 7, grade 12 titanium in various nitric acid concentrations at boiling temperatures. The solutions were refreshed every 24 hours. In stagnant or non-refreshed boiling nitric acid solutions, the corrosion products such as Ti4+ and Ti3+ will be dissolved into the solution and can effectively inhibit the high-temperature corrosion of titanium in nitric acid. Other dissolved metallic species, including Si4+, Cr6+, Fe3+, or various precious metal ions, exhibit similar inhibitive characteristics. Due to the corrosion inhibition effects, titanium can be widely used for the construction of equipment in nitric acid processes such as stripper boiler loops, hold tanks, stripper sumps, and evaporator reboilers, etc.